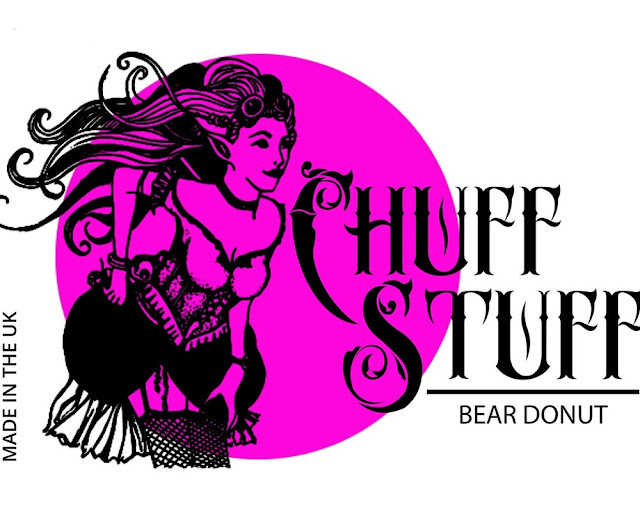 BEAR DOUGHNUT, CAMPERS DELIGHT, WATERFELON, CALLIBERRY CRUNCH, MORPHEUS CHOICE, LOUNN'S NECTAR, GINGER WAFFLES, EVE'S SEDUCTION. 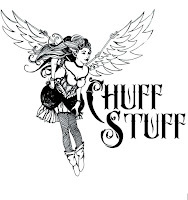 Chuff Stuff offer an amazing choice of e-liquids. There are 10 fabulous flavours to choose from. Flavours that will suit everyone's taste. 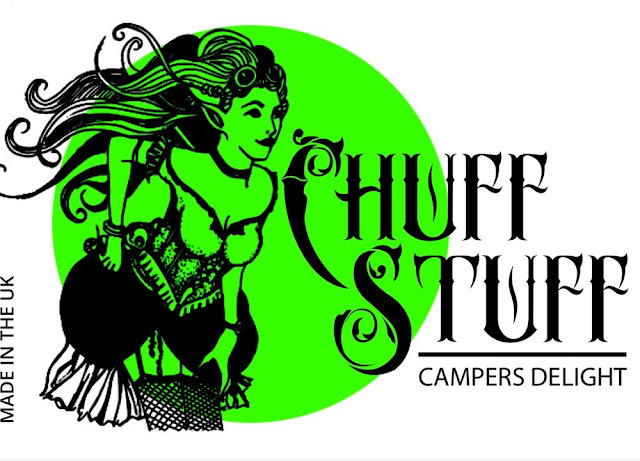 Heather who runs 'Chuff Stuff' has been running the company for sometime now. They are a small run company. 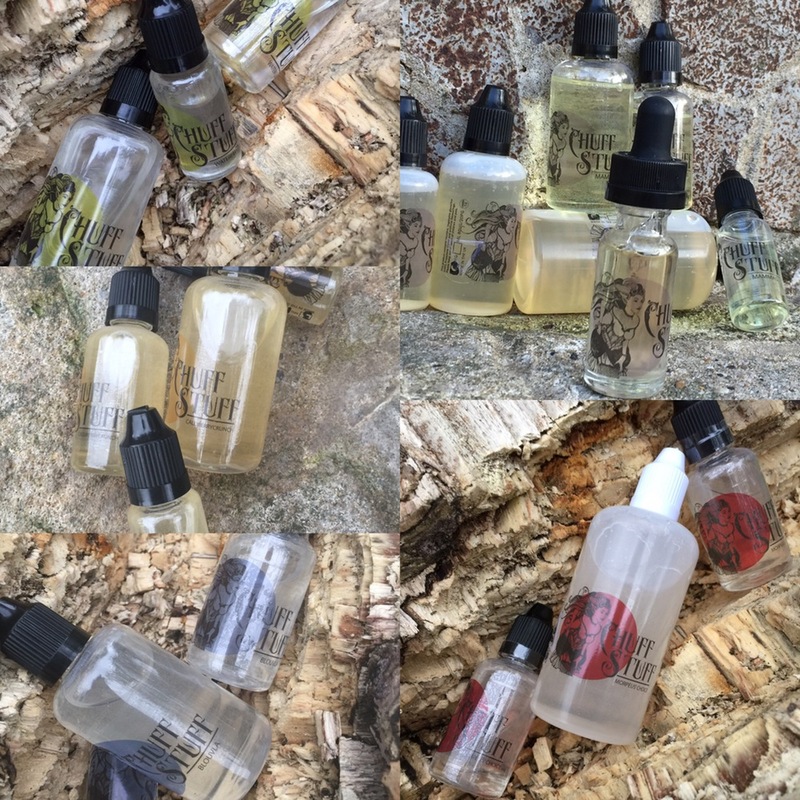 Their e-liquids are made in small batches to control quality. 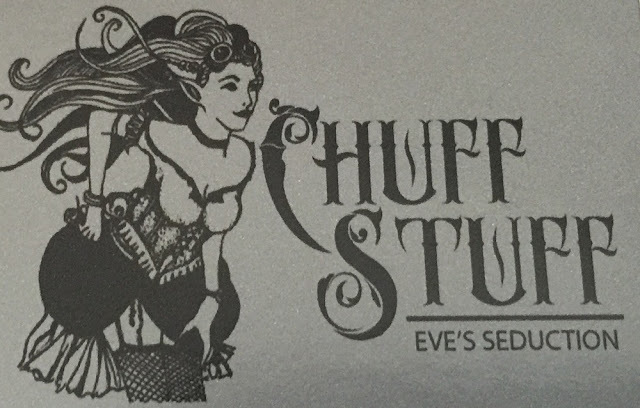 They have a large following of fellow vapers in our ever growing vaping community, and have a company who strive to please their customers, and serve the public to the highest level possible. Heather who is an Author and an ex-professional ballroom dancer, has worked very hard to make her E-liquid business the best there is, and is very proud of her achievement in doing so. Their customer service is impeccable, their standard in e-liquid can't be beaten, both in quality and price, and they are a credit to our vaping community. Shipping times are remarkable, as is the standard of service they produce. They take pride in all they do, and it clearly shines through in their e-liquids. 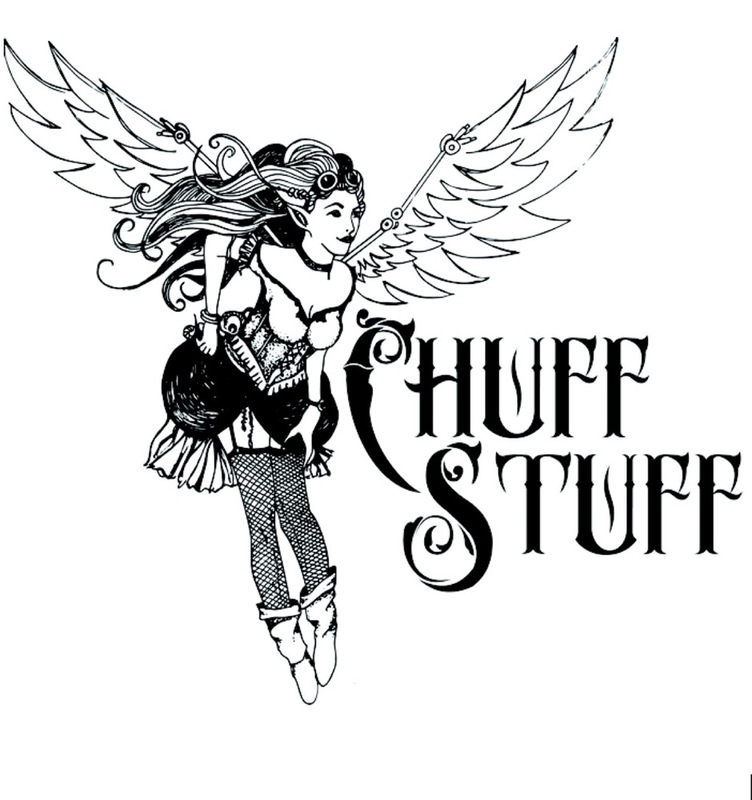 The ingredients used by 'Chuff Stuff' are of the highest quality, and are made by them, here in the UK. The e-liquids I am reviewing are all 6mg - 80vg\20pg, apart from Lounns Nectar tobacco, which I chose in 18mg 80VG/20PG. ► Bear Doughnut: Bear doughnut is a banana, honey, sugar & cinnamon sprinkled doughnut. This vape has been blended to have only the slightest hint of cinnamon. *Not a tank cracker. ► Campers Delight: Think... Smores from your childhood camping trips. Biscuity marshmallow with a dollop of chocolate. This creamy goodness will tick all the boxes. *** This vape is dark due to the double chocolate concentrate used. They will be ordering the clear chocolate in future. ► Waterfelon: Mouthwatering watermelon swirled with sweetness of mango, and a dash of lemon. All the sweetness and tartness rolled into one great vape. ► Calliberry Crunch: If you love your cereal vapes, this CalliBerry Crunch will hit that spot. Smooth, sweet, and just the right mix of cereal. Unlike any cereal vape you've had. Very addictive. 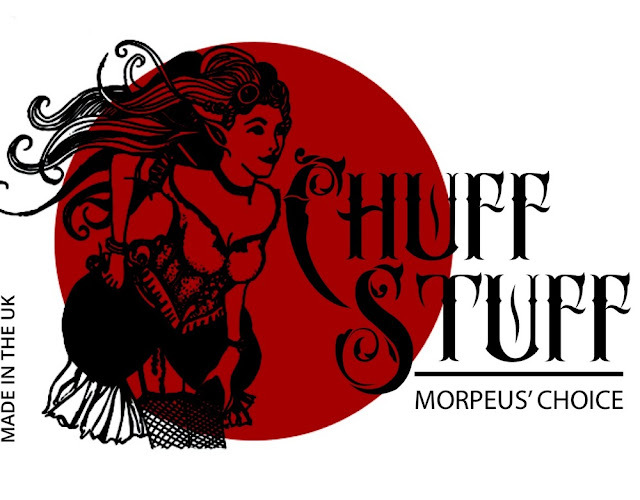 ► Morpheus Choice: Blue vs red . Blue berry and strawberry blended together with a dash of yoghurt. Fresh, fruity and delicious any time of day. 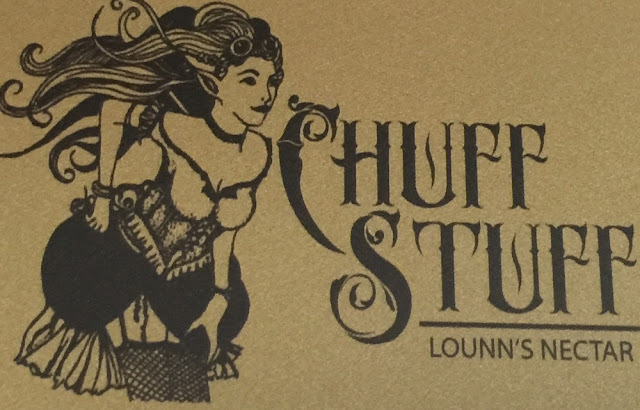 ► Lounn's Nectar: Lounn's Nectar is an apple butterscotch Tobacco flavour. Very Light Apple, medium butterscotch, medium tobacco. All round a great juice that develops with age. The longer it steeps the sweeter the butterscotch develops. ► Eve's Seduction: Green Apples infused with the lightest hint of champagne. Crisp, tart, and yummy. ► Mamma's is a strawberry and cream with a little something else added. ► Blouvla is a blueberry custard flavour. Both are extremely good. 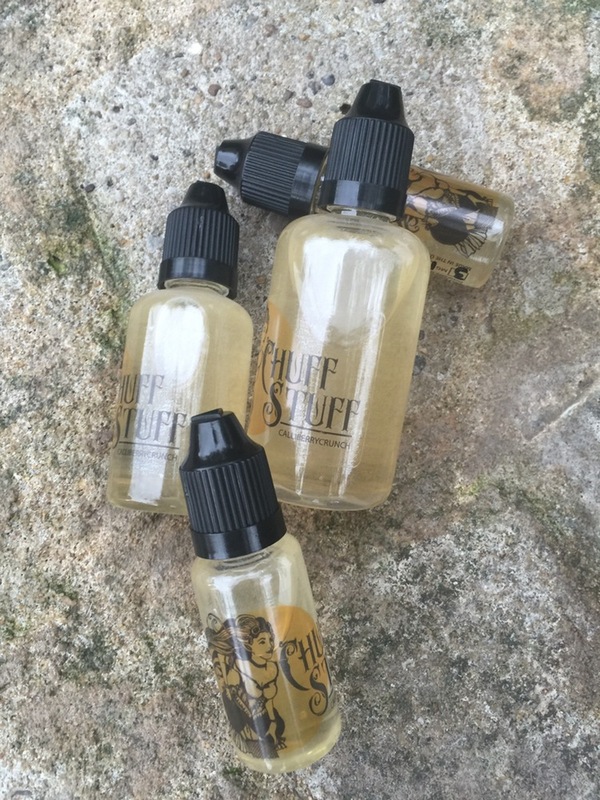 All 10 Chuffstuff liquids for your pleasure. The juice comes in 0, 3, 6, 12, & 18mg. You can choose single bottles 15ml - £4.50, 30ml - £7.50, 50ml - £11.50, & 100ml - £20.50. My preferred nicotine level for this e-liquid is 6mg. The bottles come with child safety caps and tactile warning triangles. The labels are clearly printed and easily read. There are 10 flavours to choose from on Chuff Stuff's website. Bottle Type.............................................Unicorn bottles for 15ml & 30ml. Larger 50ml & 100ml bottles come as standard. On opening the bottle, while releasing their full aroma into the air, the distinctive scent of freshly baked fluffy doughnuts, sprinkled lightly with cinnamon sugar wafted in front of me. It was a distinctive scent, and as it drifted from the bottle, I felt the sensation of comfort, and the soft sweet warmth of my late mothers baking, filling the air with the aroma of warm, freshly baked doughnuts, just waiting to be devoured. Straight away I knew I was going to enjoy this one. It's aroma spelled out one word - HOME. On the Inhale, the complexity and the creaminess of this juice is at it's best. It is jam-packed with flavour. The initial hit is a well balanced mix of sugary soft doughnut sprinkled with warm cinnamon sugar. Bready notes are at the height of the inhale with the doughnut taking precedence. It's an old fashioned type of flavour and one which really sparks the imagination. On the exhale, the sweet taste of honey, and the creaminess of the banana make this e-liquid a mind blowing flavour. Licking my lips I get a powdered icing sugar feeling, as if I was biting into a real doughnut. It was sweet but not overly sweet and the flavour remained constant with every vape. At the end of the exhale you're left with a sweet cinnamon bakery flavour not unlike hot cross buns with notes of honey and banana. An extremely satisfying vape and one that's hard to put down. Summary:- The e-liquid is perfectly balanced, with no strange after tastes, no chemical smell nor taste. sweet but not overly sweet. An all day vape for me without being sickly or overpowering and still having all the creaminess of the banana and the rich flavour of the doughnut without being cloying. The cinnamon is very smooth with just a hint of spiciness to carry the doughnut flavour with ease. All in all a fantastic e-liquid. I really enjoyed this one. It was smooth on the palate, very refreshing, with just the right amount of spice added. The flavours are blended beautifully together, which complimented the juice perfectly. There was a slight sweetness, and it was just the right amount. It wasn't in any way cloying or overpowering, and left me with feelings of consistency and richness, stillness and contentment. Simply divine. Would I buy this e-liquid ............................... Yes, I bought a 100ml bottle and have since purchased my second 100ml bottle. Would I change anything about it ................. No it's perfect. Final Thoughts.............................................. Compliments again to Heather for another awesome e-liquid. Bottle Type...............................................Unicorn bottles for 15ml & 30ml. Larger 50ml & 100ml bottles come as standard. On opening the bottle, an earthy aroma fanned from the bottle. There was a slight marshmallow sweetness with a pleasant hint of cacao beans, just like smelling a freshly made cup of hot drinking chocolate. A sweet biscuit scent, which was very pleasant, carried the aroma to a different level. On the Inhale, the cocoa/chocolate taste was extremely lush, not overwhelming, nor too sweet, but just enough to give the right taste to this decadent Smores vape. It was easy on the palate and the chocolate was more pronounced on the inhale, giving a well balanced, soft, luxurious vape. I could taste a slight undertone of vanilla, but very minimalistic and hardly there. I did an nose hit and lung inhale and the flavour changed from a chocolatey cream to the nicest smores dessert vape I've ever had. I could taste every flavour in there as the juice sat in layers of yummy goodness, laying softly on my palate, thick and well pronounced. The chocolate was light and chocolatey, the way a good chocolate should be. It wasn't bitter or strong, and was the perfect balance of light and dark. Very smooth, covering every inch of my mouth. A full mouthfeel which I didn't want to put down. On the exhale, Fluffy marshmallow clouds and a little hint of cocoa bean in the aftertaste but not heavy or artificial in any way. It was light, smooth and very pleasant. The entire mixture had notes of sweet crumbly biscuit, and maybe a a little coffee thrown in to make the cocoa bean come alive. You don't taste the coffee but it gives chocolate flavours a lift. The flavour was somewhat enigmatic, a mixture of crisp cookie, sweet marshmallow and definitely rich cacao chocolate. I find it tastes best when vaped slowly, and the after taste remaining on your palate is simply divine. Sit back, relax, close your eyes and think of heaven. Summary:- This is a remarkable e-liquid. You get exactly what it's meant to be....... A 'Smores'. I really enjoyed this one and ordered another bottle as it's so good. I've not been vaping it all day everyday but could do very easily, it's one I sit and relax with and feel at peace, but once you start vaping the flavour, it can be hard to pull yourself away from it. If you're a chocolate lover like I am, go over to Chuff Stuff and buy a bottle. You won't be disappointed. Would I buy this e-liquid ............................. Yes, I already have. Would I change anything about it ................No, it's already perfection at it's best. Vapour Production ...................................... Excellent, as it's a high VG juice. It produces a solid amount of vapour. ADV............................................................. Yes it could be, but it can sometimes be a little rich for a morning vape. I tend to stick to coffee and tobacco vapes in the morning or a nice green peach tea, depending where my mood takes me. Final Thoughts............................................. Amazing juice. Heather you should be proud. You know exactly how to make a great e-liquid. A clean fresh tasting juice with no acidity, bitterness or chemical aftertastes. It's thick, it’s creamy, it’s decadent. This juice oozes flavour and compliments a cup of coffee beautifully at any time of day. Bottle Type..............................................Unicorn bottles for 15ml & 30ml. Larger 50ml & 100ml bottles come as standard. On opening the bottle, the aroma of sweet watermelon with notes of lemon wafted from the bottle. It's fragrance was vivid and very refreshing. The aroma made my mouth salivate with excitement, as I was just about to delve into another of Chuff Stuff's amazing flavours. There is nothing more refreshing than fresh summer fruits straight from the cooler, as it enhances their flavour. On the Inhale, my tastebuds came to life as I took my first puff. A sharp but very subtle Sicilian lemon flavour slowly passed over my tastebuds, followed by a sweet juicy refreshing watermelon flowing effortlessly over my tongue, filling every crevice of my mouth with a feeling of freshness. On the exhale, the palate exhibits watermelon, mango and lemon flavours.. Very refreshing and naturally fresh. The e-liquid is very refined, light and bubbly. It gives your palate a lift as the citrus, tangy, sweetness of the fruits lie softly on your tongue, waiting for you to lick your lips, and take another puff. The mango appeared proud on the exhale, finishing with the lemon and watermelon, making this e-liquid another top vape. Summary:- This flavour definitely brings your tastebuds to life. It's invigorating, fresh and very palatable. If you enjoy a refreshing exotic/citrus blend then this one is definitely for you. The flavours are blended beautifully together, and complimented the juice perfectly. There was a slight sweetness, and it was just the right amount. It wasn't in anyway cloying or overpowering, and it left me with feelings of consistency, freshness and a nice lingering taste on my palate. Would I buy this e-liquid ....................Yes, I was pleasantly surprised that the mix of flavours worked so well in this e-liquid. The perfect blend for any fruit lover. Would I buy this e-liquid .....................Yes, I already have. On opening the bottle, a light fruity scent lifted from the bottle. The aroma wasn't strong, but still very complex to selectively choose what was actually in the e-liquid. An oat/wheat aroma filled the air with notes of juicy raspberries, but at that point I was unsure of what else was in the juice. I was hoping it would vape as good as it smelled, and there was only one way to find out. On the Inhale, the raspberry took precedence over the other flavours. A wonderful berry flavour, flowed onto my palate with no effort at all, resting gently on my tongue. Tantalizingly smooth and extremely seductive. An all over creamy taste came in waves in my mouth. One minute you could taste the berries, the next minute the milkiness. True indulgence at it's best. On the exhale, flowing over my palate, caressing my tastebuds, and enveloping the whole of my mouth with such passion, and with such skill. Slowly leaving a lingering trail of fruitiness as it passes over my lips into the atmosphere. The flavour of the berries generously linger in the mouth, exciting your palate and leaving a scent of everything summer in your surroundings. At the end of the exhale the cereal and milk blend with the berries, making this an amazing breakfast vape. Summary:- I really enjoyed this one and I will continue to buy it as it's a beautiful vape. Would I buy this e-liquid ...............................Yes, I already have. Would I change anything about it ................. No it's perfect as it is. ADV............................................................... I wouldn't say it was an all day vape for me, but It could be for you. Final Thoughts...............................................A clean fresh tasting juice with no acidity, bitterness or chemical aftertastes. On opening the bottle, the sweet tender aroma of freshly picked strawberries filled the air, followed by the creaminess of the yoghurt. It had a strong strawberry essence, and reminded me of McDonalds Strawberry milkshake. On the Inhale, the sweetness of the strawberries softly caressed my palate. The juice is sweet, but in a good way, it's also a little tart, but this is carried perfectly by the sweetness of the fruits. On the exhale, a refreshingly light, slightly sweet yoghurt passed my lips. It wasn't a sour Greek style yoghurt, it was more of a creamy yoghurt with the slightest hint of tart. There are so many different types of yoghurt being sold today, and trying to distinguish one from the other can prove difficult. This one has it all. It's fruity and creamy, and one I really enjoy. It's not an ADV for me, but I enjoy vaping it on and off throughout the day, keeping it in rotation with my other daily vapes. Summary:- A beautiful enigmatic flavour and one to try when you get the chance. The strawberries and blueberries are fresh and sweet, with a slight tartness to the yogurt, giving the juice the perfect balance of sweet & sour. Would I buy this e-liquid .......................... Yes, I already have. I bought big bottles of all ten flavours as there isn't one I don't enjoy. They are all very good. ADV........................................................... Yes, it could be. Final Thoughts........................................... This was a delicious, rich tasting dessert/breakfast vape, with a pleasing mouthfeel, making the e-liquid perfectly balanced and easy to vape. The berries with the creamy yoghurt intermingled nicely to give the balance of sweet and tart. Bottle Type...........................................................Unicorn bottles for 15ml & 30ml. Larger 50ml & 100ml bottles come as standard. On opening the bottle, the fragrance begins with top notes of a light subtle tobacco. I'd say maybe a mild virginia tobacco. It's very mellow and in no way gives that dirty ashtray aroma that many other tobaccos have. On the Inhale, It's clean tasting and has a subtle ambrosia of butterscotch and green apple. Since I began vaping it I had noticed from the description that the butterscotch and tobacco are both medium in flavour, telling me this could be a butterscotch tobacco with subtle notes of apple added to the blend. This is a gorgeous clean vape. Heather has done it again. This lady certainly knows how to mix juice. On the exhale, a rich, creamy, decadent butterscotch and tobacco took precedence over the apple notes which stayed in the background, but were still present throughout the vape. Warm, rich and tasty is how I'd describe this e-liquid. It's a very satisfying tobacco flavour. Smooth and full of texture, and one that should appeal to a lot of vapers who enjoy their tobacco vapes. 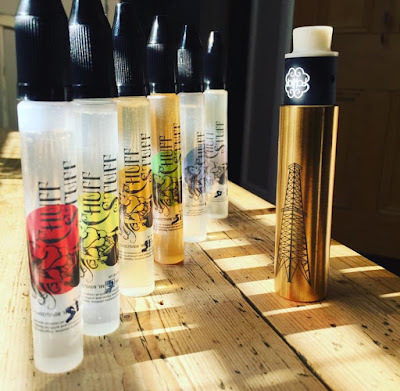 Summary:- The apple is subtle but definitely present in the juice, and the calming butterscotch flavour works to give the juice its overall smoothness. Another winner. Would I buy this e-liquid .............................. Yes, I bought a 100ml. ADV............................................................... Yes, it's in my daily rotation. Final Thoughts............................................... It states in the description this e-liquid gets better with age. The longer you steep it the more the butterscotch flavour comes through. This is very true. I wasn't sure about this one to start with, so I left it to sit for a few weeks in a dark cupboard, shaking it everyday and letting it air before trying it again and it's gorgeous. I have it in my OBS Crius V3 and the flavour and vapour production is amazing. Bottle Type..........................................................Unicorn bottles for 15ml & 30ml. Larger 50ml & 100ml bottles come as standard. On opening the bottle, the fresh and fragrant aroma of sticky Ginger compote wafted in the air. Rich and sweet, with top notes of vanilla, and a bakery fragrance similar to a warm baked Gingerbread straight out of the oven, topped with lashings of vanilla ice-cream, served on top of freshly baked hot waffles with a hint of cinnamon sugar. The combination of flavours work very well together as a whole. Savoury with sweet is the ideal match for something as indulgent and delicious as this. On the Inhale, delicate waffles fanned over my palate. A light savoury/bakery note, accompanied with sticky ginger compote and cooling vanilla ice-cream. The Vanilla is aromatic and contributes warm, caramel notes to the juice. It’s a gentle but distinct flavour that complements the ginger nicely. On the exhale, a soothing, and subtle ginger flavour followed by a light cinnamon spicy aftertaste, softly caressing my tastebuds, and filling my mouth with an array of mellowing, gentleness. Naturally sweet and creamy. All flavours compliment each other nicely, encapsulating my palate with every draw. 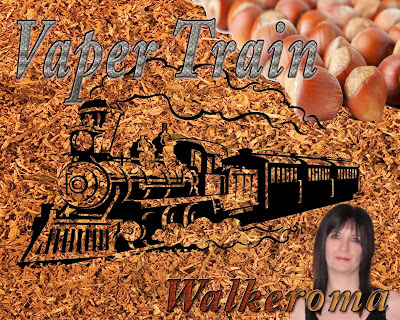 Summary:- A mouthwatering dessert vape with ginger compote/syrup top notes, hot buttery waffles and vanilla ice-cream. Pure indulgence. A deluxe dessert vape from Chuff Stuff. 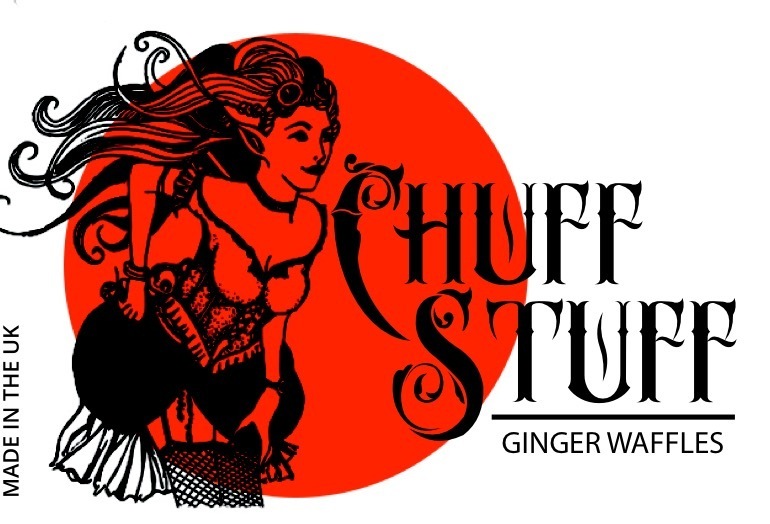 Ginger waffles is sweet but not overly sweet, and is complemented perfectly with the other flavours. ADV.................................................................. Not for me, can become quite rich after vaping it for long periods of time. This is a flavour to be savoured. Final Thoughts................... ..............................Another winner from Chuff Stuff. Such a smooth satisfying vape. Bottle Type...................................................................Unicorn bottles for 15ml & 30ml. 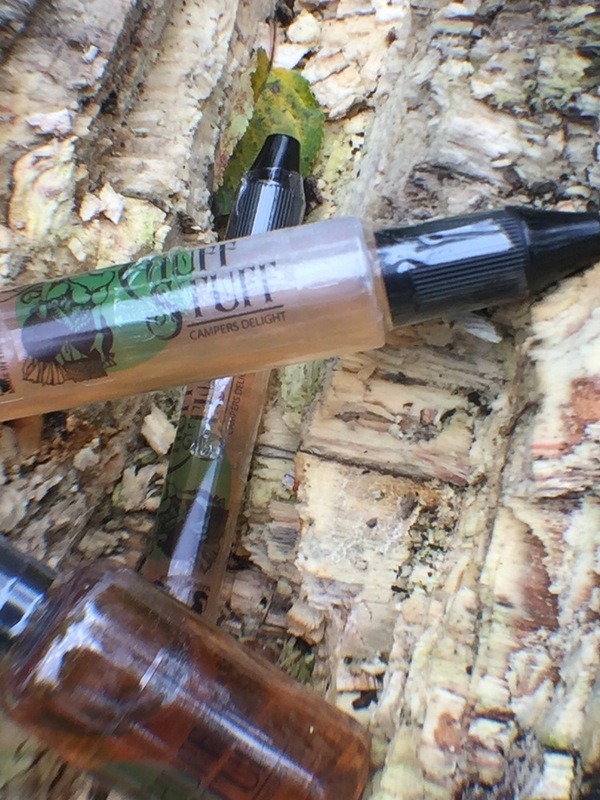 Larger 50ml & 100ml bottles come as standard. On opening the bottle, a deliciously crisp and fruity apple aroma fanned from the bottle. It's scent reminded me of a Granny Smith apple, but with just enough sweetness to make it vapable. On the Inhale, the flavour of a freshly picked crisp green apple, soothing, with a natural sweetness and a little bit tart to carry the juice to another level of freshness. The apple is aromatic and contributes warm, floral notes to the juice. It is delicately fruity with a silky smooth mouth feel, giving you a full and flavourful vape. A perfect balance with a pronounced aftertaste. On the exhale, clean and invigorating, the flavour wraps itself around your palate leaving a lingering realistic taste on your tongue with a little fizziness from the champagne, leaving notes of a candied apple in the background. 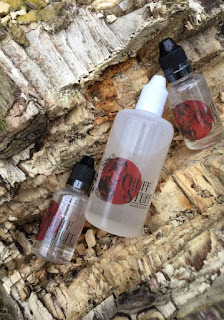 This flavour has tendencies to change from candied apple to fresh apple depending on the wattage you have it set at. It's an amazing flavour. Very fresh and an extremely clean vape. 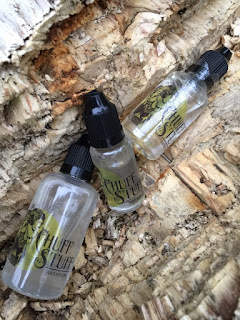 A semi sweet and fruity e-liquid, which is naturally sweet but not overly-so. If you enjoy fruity vapes, you should try this one. Summary:- Yet another e-liquid from Chuff Stuff I really enjoy. I can't wait to see what new flavours Heather brings out next. If they're anything like the ones she has at the moment, they'll be amazing. Final Thoughts............................................. A very satisfying vape. Very refreshing. 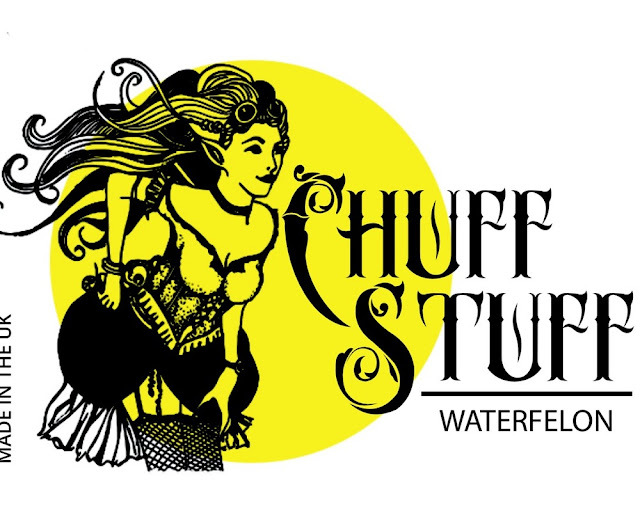 Chuff Stuff are a small run company. 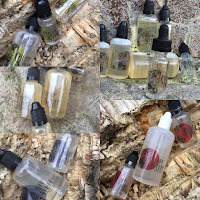 Their e-liquids are made in small batches to control quality. Should you wish to contact them either to stock their liquids or a customer enquiry please do so via email on or telephone. They have outshone themselves with all ten fantastic flavours. 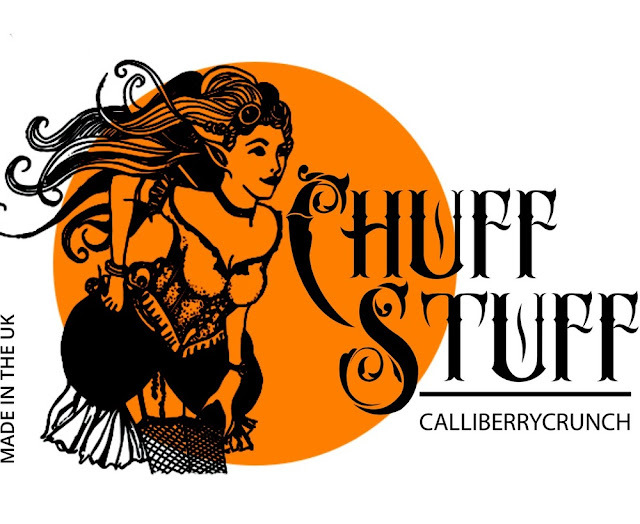 If you haven't experienced Chuff Stuff's e-liquids, I highly recommend you go along to their website and give them a try. You won't be disappointed. There is something there for everyones taste.